Sunday Morning Soliloquy - Musings of an Urbanite: Summer in Chicago Keeps Me Busy! Summer in Chicago Keeps Me Busy! We all wait for summer in Chicago.... we wait eight long months, we suffer though rain, snow, sleet, wind and bitter cold for just four short months of summer. Summers in Chicago are relished. Chicagoans live for the lake front, those with boats are out there as much as possible. We take advantage of the various beaches, the street festivals, outdoor festivals and concerts. And then, there are those of us who work all summer long - like me! When I worked in advertising, summer promotions ate up my summer. At Accenture, it was summer events. 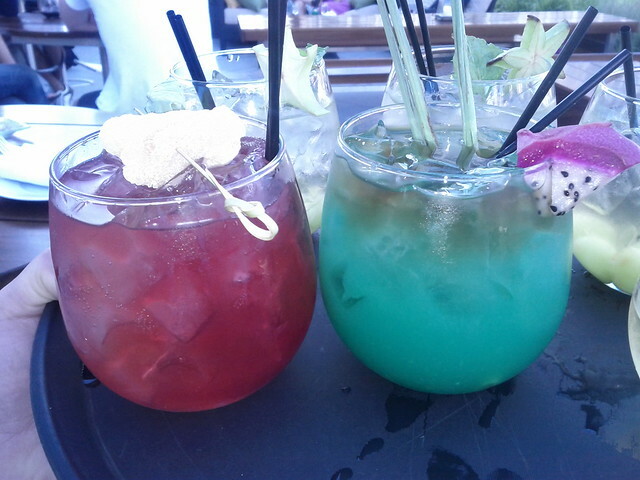 And at SUSHISAMBA, summer conventions did me in. What have I been doing? I have been in contact with some potential new business. I sent out a few proposals, I joined the Chicago Convention and Travelers Bureau, and I am reaching out to potential partners for my big event this summer (a social media scavenger hunt). 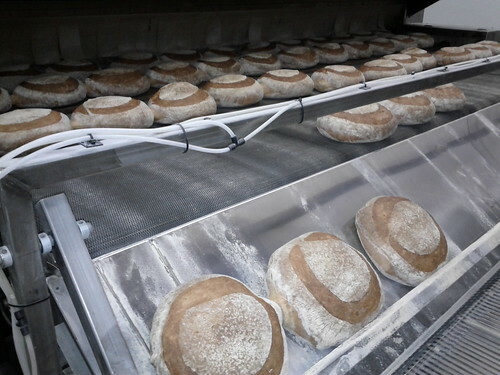 On a leisurely note, I recently took a tour of the Turano Bakery. 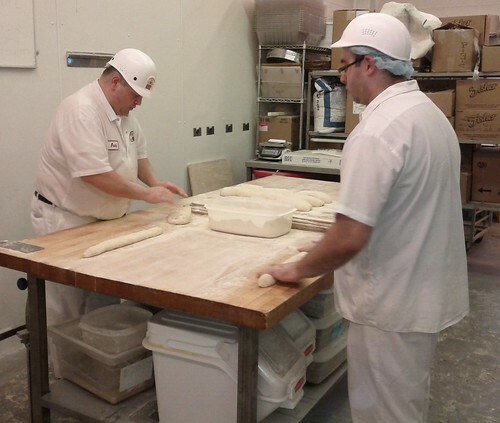 I met one of the members of the Turano family through a friend, and he invited me out to the bakery for a tour. I had never considered taking a tour of a bakery, but I was interested. 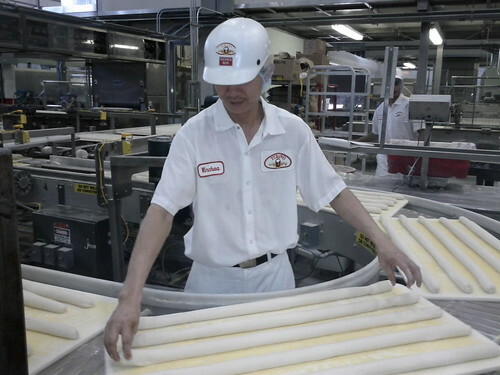 I like family businesses, I love Chicago and the Turano Bakery is a legendary Chicago, family business. We started with lunch in their test kitchen. 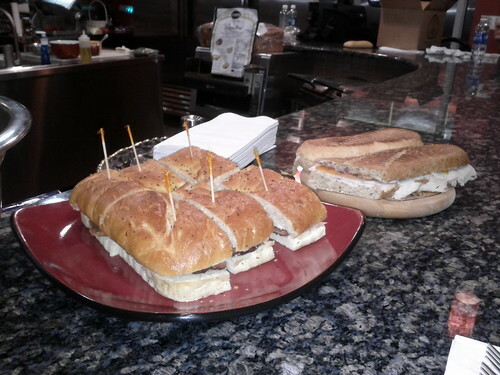 The test kitchen is where the Turano chef tries out new products, or they invite others in for lunch - like me! We had a ton of food! It was delicious. 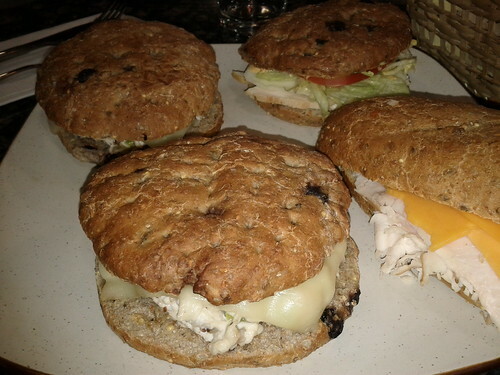 Blueberry, whole wheat rolls with chicken salad, prosciutto on Chicago-style, French bread and pork cutlet on focaccia. Next up, was the tour of the Turano Bakery. Although, I had no preconceived notions, I did not expect to be blown away - and I was blown away! Two things stood out on my visit. 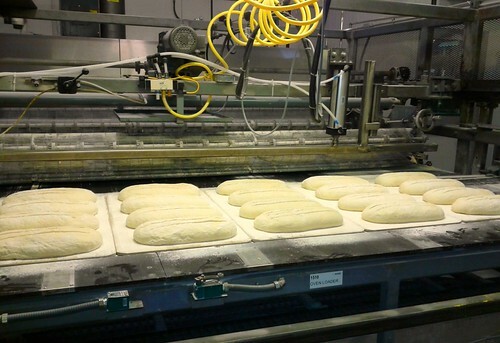 The art, science and care that went into producing the numerous product lines at the bakery. And, the level of unity and involvement the Turano family had in the business. In the short time I was at the bakery, it became clear to me that this was an intensive, labor of love. Uncles, cousins, aunts, grandparents... everyone had a place in the Turano family business. When I asked who designed a piece of equipment, the response was, "They are custom made. My uncle, we have an engineer who has been with us for many years, and engineers from the companies who produce the equipment...". We started in the artisanal bread making room. 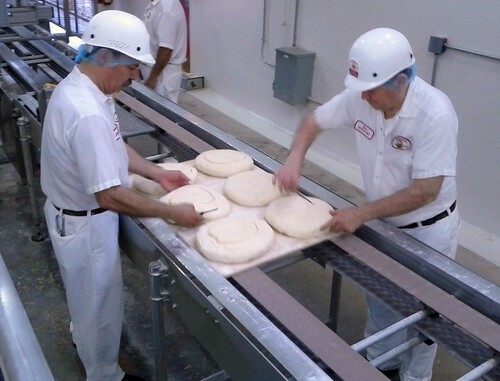 This is where bread is handmade for higher-end restaurants and hotels. 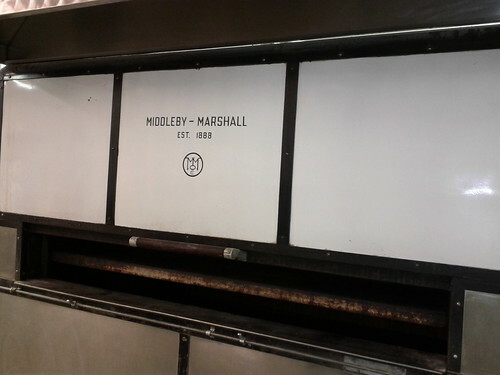 The oven used to bake the artisanal breads is the original oven that the Turano family used when the bakery first opened - refurbished of course. 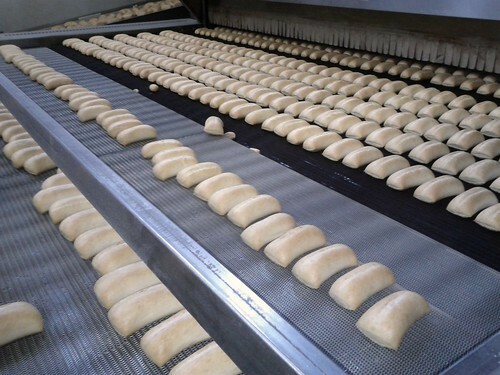 Next we walked past the lines where the Chicago-style French rolls, the mini French rolls, bakery buns and the signature Pane Turano is all made. It was surprising how much hand-work goes into finishing all of these products. 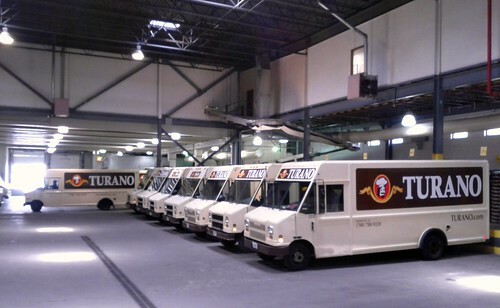 Last stop was the garage, where the fleet of Turano trucks reside. 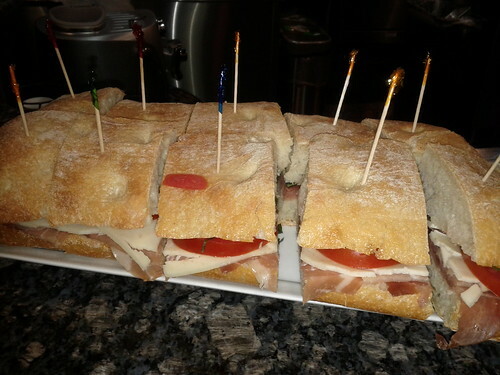 I LOVE Turano bread!!! I can just eat it all by itself.